Eddy Butler, the former National Front, former BNP, former Freedom Party, former BNP a couple more times, former BNP national elections co-ordinator, has joined the English Democrats. The announcement, which was the EDP's worst kept secret since his mate Richard Barnbrook joined in January, will be a bitter blow to the handful of party activists that haven't yet joined UKIP who had hoped to stop the BNP takeover of the party. UKIP recently announced a revised devolution policy that would see the creation of a federal UK with devolved parliaments for all four home nations. The final touches are being put to the full devolution policy paper before it goes to the membership for ratification. UKIP is the only non-racist, mainstream democratic party advocating the creation of a federal UK with equality for all four home nations. English Democrats: not left, not right, just racist. 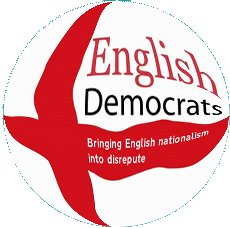 The Chairman of the English Democrats, Robin Tilbrook, has issued a threat by email demanding the removal of this post, an apology for defamation and an undertaking not to criticise the English Democrats again. His email and my reply are in the comments and needless to say he's going to be very disappointed. Robin is a solicitor and as such I would expect him to know that you can't defame a political party but judging by this latest email and the previous threats I've had off him over the years (none of which had the desired effect, naturally) I can only assume the Chairman of the English Democrats is just very bad at his job. A copy of the report can be found on the England Exists blog, amongst other places. Chris Beverley - another prominent BNP activist that the English Democrats accepted into their ranks - also confirms that Eddy Butler has joined the English Democrats. Robin Tilbrook did indeed attempt to sue me for defamation and malicious falsehood in the High Court. He lost.